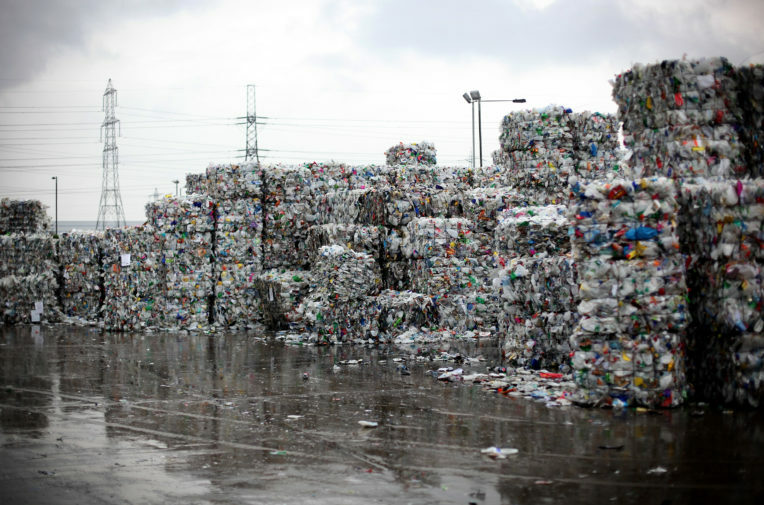 Supermarket, drinks and packaging trade associations lobbied the government to oppose new EU “polluter pays” proposals designed to boost recycling. The trade bodies, which represent retailer and brands including Sainsbury’s, Tesco, Coca-Cola, Starbucks and McDonalds, urged environment minister Therese Coffey to oppose the EU rules despite Brexit, letters from September 2016 and February 2017 released under Freedom of Information (FOI) show. The trade bodies also wrote they were “unanimous” in their opposition to deposit return schemes, where customers pay a small amount for bottles and cans, which is returned when they recycle them. Packaging and recycling are under increased scrutiny over concerns about the scale of plastic pollution in the oceans. But the UK’s recycling rates are flagging: last year they fell slightly for the first time, and experts warn there is a risk of missing the EU’s target of recycling 50% of waste by 2020. Under existing EU rules, companies pay towards recycling or disposing of the packaging they put on the market through “extended producer responsibility” (EPR) schemes. The new proposals would pass more of the costs of managing packaging waste onto the companies that produce the goods and make them pay more if their products are harder to recycle. The firms said they were concerned the measures would come in before Brexit which could “provide more flexibility” in future. But the associations argued this would massively increase their costs with “no net environmental benefit”. Coffey later said in Brussels the rules should be “guidance only”. Sam Harding of the Campaign to Protect Rural England said the letters showed the industry defending “outdated and unambitious positions”. The British Retail Consortium, the British Soft Drinks Association, the Food and Drink Federation, the Packaging Federation and packaging trade body Incpen wrote to Coffey that deposit return schemes “would seriously undermine the viability of current kerbside recycling schemes, tackle only a small proportion of littered items, impose high costs and inconvenience on consumers, and increase environmental impact”. The British Retail Consortium has more recently criticised deposit return schemes in evidence to parliament and the Times, while the British Soft Drinks Association told parliament the schemes “may not be best suited to the UK”. Deposit return schemes are gaining momentum as an idea: Michael Gove announced in October he will consider introducing a Britain-wide deposit-return scheme, a month after Nicola Sturgeon announced Scotland would go ahead with one. The Welsh government has said it may introduce a scheme “as early as next year”. The trade associations vigorously opposed European Commission proposals on packaging, part of the Circular Economy Package, which aims to boost recycling rates and reduce waste. The Commission proposed toughening EPR to make companies foot the bill for the entire process of managing their packaging waste. British companies pay a fifth of those in France and Belgium, and a tenth of those in Germany, the associations wrote. The proposals would increase payments “from the current average of £50-100m per annum to as much as £1 billion per annum,” they wrote, to “no net environmental benefit”. Andrew Opie of the British Retail Consortium said: “We have had an ongoing discussion with Defra and other organisations about this and have consistently said this needs to be addressed as part of a comprehensive environmental strategy. The Packaging Federation and Food and Drink Federation declined to comment on the letters when approached by Unearthed. Incpen did not respond by deadline. Coffey has also written that the circular economy package’s target of recycling 65% of all waste by 2030 is “too high to be achievable”. A Defra spokesman said: “We remain fully engaged in the negotiations on the EU Circular Economy Package and continue to liaise with industry and NGOs on a regular basis.